When Old Man Winter causes temperatures to plummet, your fence can become quite brittle and lose flexibility. Your fence provides a variety of benefits to your home. Naturally, you want to make sure it stays around as long as possible. Unfortunately, sometimes Mother Nature’s behavior can damage your fence. When this happens, call the professionals at Hercules Fence to come out and get it all fixed up. Here are a couple of the ways that extreme weather conditions can damage your fence! 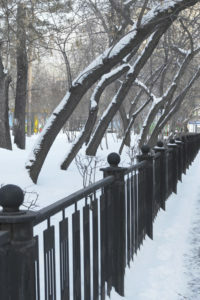 When Old Man Winter causes temperatures to plummet, your fence can become quite brittle and lose flexibility. If this happens, the slightest pressure could cause it to bend or break. Conversely, in the summer months when temperatures soar some fence materials may expand, which can cause warping. Some materials may even separate from their fasteners. While some sunlight is beneficial to many things, your fence can’t really move into a shady spot when it needs to. This leads to sun damage. Prolonged exposure to the sun’s UV rays can cause a wood fence to fade and eventually start to become brittle from extreme dryness. Fortunately, you can prevent this with a good UV-blocking stain. Like many other forms of precipitation, snow brings risks of mold and mildew. In addition to these risks, however, accumulated snow can be quite heavy. Make sure your fence is strong and properly installed. If you notice that lots of snow seems to be piling up on it, take a minute to brush it off to prevent warping and possible breaking. For most fences, light to moderate winds really aren’t an issue. However, strong winds pose many threats to even the most structurally sound fence. If you live in an area that is prone to high winds or you’re expecting the weather to bring high winds, have your fence inspected by the professionals to make sure it can withstand the pressure. This entry was posted on Friday, March 23rd, 2018 at 2:20 pm. Both comments and pings are currently closed.